When a country experiences slower economic growth, the government receives less in tax revenue and therefore has to borrow money to keep up the delivery of essential services. Any funds borrowed accumulate as public debt, and will eventually have to be repaid. This debt is not necessarily a bad thing — in fact it’s quite normal for a country to raise debt — but excessive debt could put a country’s future economic wellbeing at risk if the underlying reasons that the debt was required in the first place are not addressed. One of the ways to compare debt levels between countries is the debt-to-GDP ratio: a ratio of a country's total debt to its gross domestic product (GDP), where debt is measured in dollars ($) and GDP is measured in the value of goods and services produced per annum ($/year). Therefore, the higher the ratio, the longer it will take for a country to pay off its debt. For instance, a country with debt-to-GDP ratio of 100% could theoretically pay off its debt in one year; but realistically, a country will only devote 5-10% of its GDP to debt repayment, so it would take about 10 years to pay down the debt in this instance. We built a map to compare the debt-to-GDP ratios of the world’s most representative economies. 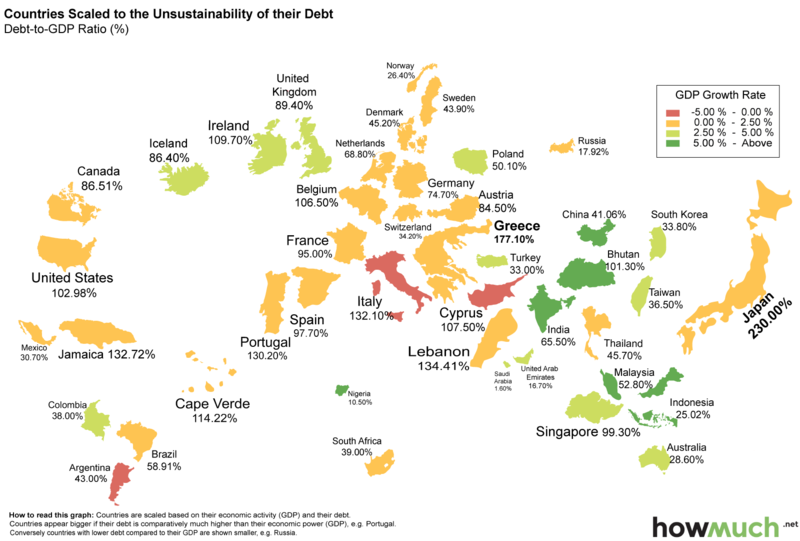 The size of each country on the map represents the level of debt — a larger size means a higher debt-to-GDP ratio. We also included a color coding to illustrate the GDP growth rates of each country: red countries have negative growth rates (-5% to 0%), and green countries have very high growth rates of more than 5%. The countries with the highest debt-to-GDP ratios are Japan (230%), Greece (177%), Lebanon (134%), Jamaica (133%), Italy (132%), and Portugal (130%). These countries, with perhaps the exception of Lebanon, also have low (or negative) GDP growth rates, which is not good news for their economic outlooks. Obviously, Greece is already dealing with financial turmoil due to its inability to pay off its debt, but other countries with high debt levels and low economic growth rates also face serious default risks (e.g. Italy and Cyprus). For the countries with the highest debt-to-GDP ratios, debt has actually been increasing over the past several years. But this isn’t necessarily a huge problem. As long as countries are using borrowed funds to successfully stimulate their economies, they will be able to pay back their debts on time. But if governments continue to borrow without increasing economic output (GDP), debt levels could get out of control and countries will be forced to default on their loans (this is what happened to Greece). Interestingly, the countries with the lowest debt-to-GDP ratios (Saudi Arabia, Nigeria, UAE, and Russia) all have large nationalized natural resource (oil and natural gas) industries. The production of oil and gas provides these countries with a relatively stable source of revenue, which means that they don’t need to borrow funds to pay for government services. It should be noted that, according to the IMF, there is no simple threshold for unsafe debt-to-GDP ratios. But the IMF has found that higher debt levels are associated with more volatile growth. Countries with high debt levels are more susceptible to collapse when economic shocks occur. The important thing is therefore not so much the level of debt, but whether the underlying causes of the high debt level are being addressed. The US has fallen from the 6th most indebted nation (in terms of debt-to-GDP) in 2014 to 11th in 2015. This isn’t necessarily great news for the US, because its debt-to-GDP ratio has actually increased to 103% from 101.5% in 2014. The US fell down the rankings not because it paid off its debts, but because other countries have taken on more debt. US debt, now at about $18.4 trillion, continues to rise. Government deficits were rare before 1975. Until then, the debt-to-GDP ratio hovered around zero, with some minor deficits occurring here and there. But after 1975, US government deficits really became the norm. Amazingly, the government deficit now is far higher than it was during WWI (debt-to-GDP of 17%), WWII (27%), and the Korean War (1.7%). The last time the government ran a surplus was between 1998 and 2001. Despite the fact that the US has a fairly healthy GDP growth rate of 2.4%, there is no end in sight to the growth of the government deficit. As long as government spending continues to rise, the country will take on more and more public debt. Many countries, including the US, are dealing with unsustainable debt levels. In order to reign in this debt, either government revenue generation models will need to change, spending cuts will need to be made, or economic growth will have to increase. How do countries successfully pay back their debt? Typically to pay off debt, a country needs to decrease spending or increase government revenues. In the short term, decreasing spending is far more plausible. Take Iceland for example. The country faced a debt crisis in 2008 after the subprime mortgage crisis in the US. Iceland’s national banks were unable to get financing from the international market, and eventually had to declare bankruptcy. What was their solution? The government restructured the country’s three largest banks, declaring them insolvent, and set up currency swap agreements with nearby Scandinavian countries. Some have argued that one of the main reasons why Iceland was able to get itself out of debt is the country’s Protestant heritage: the theory is that Protestant countries tend to be more receptive to financial discipline and austerity measures in times of financial strife. Correction: October 15th, 2015. An earlier version of this article noted that the US was ranked 12th in the world in terms of its 2015 debt-to-GDP ratio. The US actually has the 11th highest debt-to-GDP ratio in the world.